3. Students will have their own dedicated folder. 4. Students will be restricted to their own folder, and any subfolders that they create. 3. Create a folder share using the StudentData as the name, and the StudentData mount point. 4. From the Access menu create an access group called “Students”. 4. Change to the “root” of the mounted volume. 5. Allow everyone to traverse the directory, but not to change or execute, only the root (supervisor) can delete or add. 1. Get the full name of each student. 2. Assign passwords to each student. 6. Assign the student’s home folder as /mnt/StudentData/ Note that the folder does not have to physically exist yet, although if you want to be able to choose the correct folder from the drop down box, it needs to be created on the disk beforehand. 8. Be sure to save the changes clicking on the button “Apply Changes”. 4. Create a folder on the server with the same name as the login name. 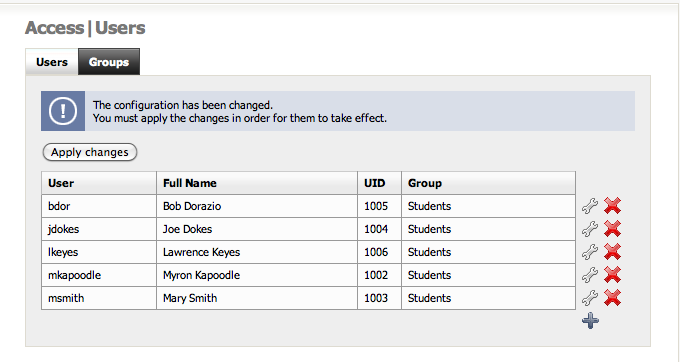 Example: I have a student named Myron Kapoodle, this person will get a folder called mkapoodle. 5. Give the student ownership of their folder, and allow the owner to read/write/execute within their folder. You’ll have to enter the name and password. This may not be entirely foolproof in a lab situation with numerous students accessing the same workstation, so I’ve developed at least a partial solution which I’ll outline in a future post. This entry was posted in Tech_Friday and tagged Education, freeNAS, Windows on November 11, 2010 by lkeyes70.